C.O. 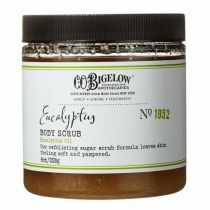 Bigelow Almond Body Scrub is an exfoliating sugar scrub that leaves skin feeling soft and pampered. Our skin softening body scrub is formulated with sugar and a special moisturizing blend of Sunflower, Safflower, Sweet Almond and Jojoba Oils to leave skin silky smooth. C.O. 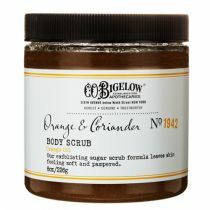 Bigelow Almond Body Scrub, with sugar and a special blend of moisturizing oils, leaves skin silky smooth. We use a special blend of nourishing oils that moisturize and protect the skin as the sugar crystals do their work. Skin is exfoliated revealing a new layer that is then pampered to become silky smooth. I have used many, many body scrubs but this is the only one I now buy. It smells amazing and makes my whole bathroom smell wonderful for hours after the shower. That alone would make it great but it also leaves my skin incredibly soft. It seems to leave behind a layer of moisturizer after I rinse it off. My skin doesn't feel greasy or oily, just very moisturized, as though I've just used the richest body cream. 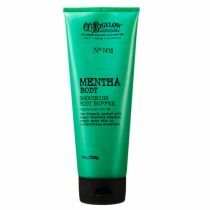 I also have very sensitive, psoriasis-prone skin and this product has never irritated it. I never write product reviews but I had to share my experience with this one. It's that good! Almond Oil is easily absorbed so its beneficial ingredients begin to help soothe sensitive skin. The exceptionally high, unsaturated fatty acid content helps to strengthen the skin. It’s packed with essential fatty acids to help your skin stay nourished and moisturized. Rich in vitamin E and helps to protect skin from environmental aggressors to gently soothe skin. Jojoba Seed Oil, a plant that actually produces wax esters identical to our very own sebum, contains many essential fatty acids, powerful antioxidants and vitamins. Rich in Vitamins A, D and E, Jojoba gently regenerates skin cells. Fatty acids Omega 6 and 9, as well as Docosanol, work to repair damaged skin cells. Safflower oil prevents dryness and roughness and removes dirt and oil. Its hydrating properties lend skin a healthy glow, promote elasticity and reduce the appearance of wrinkles. Ingredients: Sucrose, Mineral Oil (Paraffinum Liquidum, Huile Minerale), Fragrance (Parfum), Caprylic/Capric Triglyceride, Simmondsia Chinensis (Jojoba) Seed Oil, Carthamus Tinctorius (Safflower) Seed Oil, Prunus Amygdalus Dulcis (Sweet Almond) Oil, Glycine Soja (Soybean) Oil, Helianthus Annuus (Sunflower) Seed Oil, Aloe Barbadensis Leaf Extract, Hydrastis Canadensis (Goldenseal) Root Extract, Panax Ginseng Root Extract, Cucumis Sativus (Cucumber) Fruit Extract, Tocopheryl Acetate, Caprylyl Glycol, Sorbic Acid, Phenoxyethanol, Benzyl Benzoate, Benzyl Salicylate, Butylphenyl Methylpropional, Coumarin, Hydroxyisohexyl 3-Cyclohexe Carboxaldehyde, Limonene.